With pride from Greece, Athenos defines a brand name for cheese made using authentic Greek methods. Athenos is owned by Kraft Foods. All the ingredients in Athenos are strictly Greek, as are the cooking methods. The main concentration of this brand is the time and care taken in making their delicious, authentically Greek cheeses. Athenos products can be used to flavor any dish calling for cheese, while adding a Greek touch of course. From pita chips to fully flavored hummus, there is an option offered by Athenos for your type of snack or meal. Chef Yiayia, who is an expert with Athenos products, and one of the most valued exports from Greece, teaches the world on how to use effectively Athenos products to achieve the wonderful results when using Athenos products in your recipes. Yiayia may be considered to be from the old world, but when put on camera with her assistant Jessica, she will show you just how old techniques can fit into modern foods and kitchens to bring up some of the most flavorful recipes by Athenos. Yiayis puts it in a simple way: creativity should be expressed in the kitchen. Videos on Chef Yiayia can be found online as she explains to the world how to make the best use of Athenos products. Athenos is popular in Europe and America. Greece is its country of origin and hence its wide acceptance in Europe and close countries. In America, Athenos has gained much popularity and this could be attributed to the wide range of meals that Athenos can be used with and the high nutritional value that it has to families. Real Feta cheese is not made with cow’s milk but rather goat’s milk. 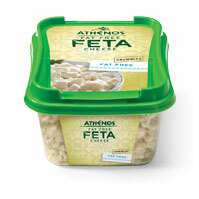 Athenos is not an authentic feta cheese, you will have to read the label to make sure.